PSX Mortal Kombat Mythologies: Sub-Zero (USA) in 28:50.6 by Thevlackdemonn2294. Mortal Kombat Mythologies: Sub-Zero is a story-driven fighting game that puts you in the shoes of Sub-Zero and chronicles a series of events that occurred prior to the first Mortal Kombat. You, the Lin Kuei's most cunning assassin, are sent to steal an important document. However, this mission proves to be a test from a mysterious character (who turns out to be MK4's Quan Chi) who charges you upon retrieval of the document to recover an ancient medallion of untold power. Upon your return, Quan Chi reveals that he actually tricked you, and the medallion is the key to awakening the demon Shinnok (yup, the same baddie from MK4). Now a reluctant hero, you must pursue Quan Chi through hell itself hoping you get to Shinnok before him. Technically speaking, this game represents the final evolutionary step in the MK series' 2D engine. The game takes the familiar 2D Mortal Kombat fighting environment and turns it into a hybrid fighting/platform game, where you must run and jump through hazardous levels as well as fight your way through both digitized and polygonal enemies. 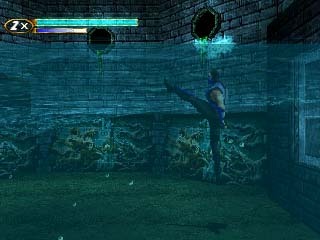 Sub-Zero's interface is the same as in every MK game, with the addition of the "use" and "turn around" buttons, an inventory, and a slight RPG twist that gives you EXP for defeating opponents which becomes new techniques and moves to execute in the game. The author, Thevlackdemonn2294, uses precise movement as well as tricks and glitches to beat the game in under half an hour.